I'm not a huge fan of New Year's Resolutions. They usually just get all blown up in January and then start to fade after that. I do like to reevaluate my life and see where I would like to make changes, etc. This year I saw a great idea from Ali Edwards about choosing a word for the year. I really liked that idea, so that I can carry a theme for the year with me. 1. completed; done; effected: an accomplished fact. 3. having all the social graces, manners, and other attainments of polite society. I think the biggest accomplishment I want to see happen in 2009 is growth in my Close To My Heart business. Wishing all of you a Happy and Full 2009! I turned a big 32 today. My biggest problem concerning my birthday is I can't seem to remember how old I am now. I remember that I turned 30, but 31 and now 32 seem to blend together. Guess I'll have to practice my age, you know how little kids have to practice there age. You must have to do that when your really young and then when you get really old. I can use 3 fingers on one hand and 2 fingers on the other. Thanks to all my friends and family for my wonderful birthday wishes and gifts. Kenny and I are going to go to dinner this evening. A big thanks to my friend/neighbor Ann for sitting around our house this evening as Shane sleeps and we eat. Kenny surprised me with a tiny Olympus Digital Camera. I have my big Nikon SLR that I love and use all the time. But I've been yearning for a little one that I can just have in my purse or back pocket for every day on the go use. Just this morning I was telling him about how I may use some of my Christmas money to buy this little camera I saw at Costco last week. Guess he sorta freaked when he heard me say that. He totally totally surprised me though. I had no idea, even when I saw it wrapped. Another favorite gift I got today was from my friend, Julie. She brought me over 3 fantastic coupons in the cutest little book she made. One for babysitting Shane so Kenny and I can go out, one for tea with her (no kids allowed) and one for a home cooked meal. I can't wait to use them!!! Thanks again everyone for making my big 32nd birthday special! We settled into Reno quickly and were really excited to be there with all of Kenny's family. His younger sister, Aimee and finance, Chris were there from Denver. His older sister Claire, husband Joe and daughters Carolyn (4) and Meredith (2.5) were there from Sacramento. And of course his Mom and Dad. Shane had tons of fun playing with his cousins. We woke up to a very white Christmas. Eight inches had fallen over night. There were times during Christmas day we thought the power was going to go out. Grandma and Grandpa Booth with all three grandkids. The Family: Chris, Aimee, Claire, Joe, Jessica, Kenny, Jeni and Joe. Our super cool Snowman we made on Christmas Eve. There was a couple of inches of snow on the ground when we got to Reno, which ended up being great for making a snowman. A Christmas Day snowball fight. The finished product. We were all impressed by it. We visited some friends of Kenny's (K.J., Becca and Stella) from high school. It was our first time meeting little Stella (6 months). Here Shane and Stella are checking each other out. The flight home. Shane loved sitting at my feet. Getting home was a breeze compared to getting down there. Shane even slept for the last 20 minutes of the flight home. We headed for Reno on Monday. That day has now become one of my top 5 worst days of my life. What an experience it was to get to Reno. Here is a little run down of what happened. We knew the trip to the airport was going to be rough with all the snow. Kenny got the dogs to the kennel with no issues. He did put chains on his car before he headed out though. He would have never gotten there with out them. When he returned we hopped in the car for a long drive to the airport. The roads weren't to bad, but the chains helped quite a bit. Parking the car and the shuttle ride was uneventful. Besides the fact that we could have used more arms with all the bags we had. When we entered into the airport there were people EVERY WHERE. Lines were a mile long. We headed to the baggage check line, which was wrapped around and around the airport. It took about 30 minutes to get to the counter and check our bags. All while trying to keep our wiggly little toddler happy and keep the tons of baggage we had moving every two feet. Next we headed to security. Not too bad there. We get all gathered back up and head to our gate. We briefly glance at the arrival/departure board....ah, what...our flight has been canceled!!??!? Yep, minutes after getting through security it was canceled. We drag ourselves to a couple lines before getting in the right one to figure out what we do next. Our options are stand-by or stand-by. We choose to fly stand-by to Reno at 3:45 (that gave us 5 hours to kill in the airport) and stand-by to Sacramento at 4:25. You ask, why Sacramento? Kenny's sister lives there and it is only 2.5 hours from Reno. His parents could pick us up there and we'd all arrive in Reno safe and sound by Tuesday. We slowly watched time go by as we hung out in the airport. And also saw flight after flight get canceled. It was a zoo in there. Time comes for the Reno flight that we were on stand-by for....it's delayed. Now the Sacramento flight and Reno flight are going to be taking off at the same time. Kenny heads to the Sacramento gate and Shane and I stay at the Reno gate to see which one we get called on first or at all. It's Sacramento. Shane and I sprint to that gate and are the last ones to board. For various reasons we ended up sitting on the plane for 1.5 hours before it even takes off! Here comes the low of all lows. Shane has the biggest and worst poop of his life! He was covered from head to toe literally with poop. And we had no extra clothes for him. He ended up flying in a shirt, diaper and shoes. This all happened while we were just sitting on the plane. We finally take off and arrive in Sacramento at 8:30pm. Twelve hours after we had left our house that morning. For the situation, Shane did extremely well. Kenny and I held up pretty good, too. We were very happy to be able to get a flight out of Seattle. And to arrive safely at his sisters house. We got to Reno Tuesday afternoon. Exactly 24 hours after we were suppose to. What a couple of days! Here is a picture of our patio table on our deck. This represents snow from the past 5 days. It's just about 9 inches. We've been sorta snowed in our house since Thursday. I say sorta because Kenny has taken us out to the grocery store and Costco, but other then that we've been in the house. We were suppose to be in Sequim this weekend for Christmas with my family, but with the two snow storms we postponed it until after Christmas. We didn't want to take the chance of getting stuck there since we are flying to Reno to have Christmas with Kenny's family on Monday. Here are some things we've done to try to alleviate the boredom. Saved a bird from dying -- This little guy crashed into our window. I bundled him up and put him in a safe location. He flew away a couple hours later. We had a family Christmas Saturday morning. So of course we needed to leave Santa some cookies and milk Friday night. Shane enjoyed opening presents. He really got the whole thing this time compared to last year. We have laid around and slept. Here is Dodger really relaxing. Sadie and Me on the couch cuddling. We played in the snow a couple times. But it is just to cold for Mom. We had a fun cookie decorating party and gift exchange at our neighbors house. It was planned before the snow came, but it was great to get out of the house for a couple hours. One of Shane's favorite things to do is play in the laundry basket. It is even better if Dad zooms him around in it. We also hung out in our PJ's an awful lot!! 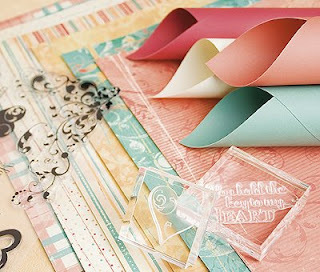 Close To My Heart has declared January as National Papercrafting Month. Now is the perfect time to celebrate all the fabulous things you can do with paper-related products. And CTMH has a promotional package that will help you do just that! It’s a simple but dynamic combo: The beautiful new Key to My Heart paper packet, featuring all four of our luscious new colors, is accompanied by the E-size My Acrylix Key to My Heart stamp set, a knockout collection of fashionable, elegant designs. Spend $130 and get the Key to My Heart kit FREE! Spend $75 and the kit is yours for just $20! Or you can buy it outright for $47.90. The campaign also has enticing opportunities for hostesses and new Consultants. Hostesses get the package FREE with a Home Gathering sales total of $400 or more, and new Consultants who join Close To My Heart between January 1–31 will receive the kit FREE in their New Consultant Kit. This promotion runs until January 31, 2009. You can shop on my website, book a gathering or sign up to be a consultant. If you have any questions, feel free to email me at jessicadbooth@hotmail.com. My Husband's Odd Sense of Humor?! Last night Kenny and I were laying in bed talking about sleep and getting up early. Shane just got out of a waking up before 6am phase and back into a sleeping in late phase (7:30ish). Kenny was giving me crap about how he has to get up at 6am and I get to have 1.5 hours of extra sleep. My comment back was that he chooses to get up at 6am so that he can run every day. He then says to me that "after all my lost sleep from when Shane was an infant I deserve the extra sleep." I instantly thought "Oh, that was so sweet". Before I even had a chance to tell them how nice that was, he follows it up with..."But as of this morning you've caught up". UGHH!!! This evening I find out that he was featured in an ESPN column. I can't really explain the whole back story to all of it, because it is really confusing. Just another example of his wonderful sense of humor. Guess I gotta love it, since I married him. "There has been running speculation in the column about whether advanced planets could fight by hurling basketballs or pints of vanilla ice cream at each other at 99 percent of the speed of light; calculations suggest that a pound of any mass striking at 99 percent of light speed would detonate with 60 megatons of kinetic energy. Kenny Booth of Bothell, Wash., supposes that accelerating a pint container of vanilla ice cream to relativistic speed would melt the contents. What you'd really want, he thinks, is Comet Crunch ice cream." Shane had his 18 month visit to the doctors today. Not a lot to report. He weighs 21 pounds (3%) and is 33 inches (50%) tall. He continues to be tall and skinny. But in his normal growth curve, so no worries by the doctor at all. He is reaching all his developmental milestones nicely. She did suggest that we start to whine him off the pacifier. I wasn't really in a hurry to do that. He still drools a lot, especially when he is doing something he is really into. She said his mouth muscles may be a little weak and the pacifier won't help that. Guess our New Year's Resolution is to say bye-bye to the pacifier. He only gets it when he sleeps, but I think it may be a rough few days of withdrawal for the little guy and us! He even walked away with out any shots today. Lucky guy! They were out of the chicken pox vaccination, so we'll go back for that after Christmas. All-in-all he is a health and happy little boy. Fisrt Snow of the Winter. We went to sleep last night with the snow falling and woke up with almost a whole inch of snow! Okay...so it wasn't very much, but Shane and the dogs had tons of fun playing in it anyways. Dodger and Sadie taking a rest in the snow after tons of circles, wrestling and romping in it. Warming up on top of the heater with a snack. Happy Half Birthday to Shane! Shane is officially 1 1/2 years old today. In just 6 months he'll be TWO! That is amazing to me. He is a funny little bugger. He sure makes each day interesting. I can say most days he has me crying tears of pain and joy. I love watching him change, learn and develop each day. We had pictures taken today at Picture People in his Christmas outfit. This was to render lasts weeks problem of forgetting his outfit when we went to JCPenny's for pictures. We survived Kenny's work Holiday Bowling Party yesterday evening. I can't say it was much of a fun or relaxing experience for myself, but Shane seemed to enjoy the new environment. He loved the air blower where the bowling balls sit. That kept him happy for a long time. Then we moved onto games. We were given tons of tokens to use. There was a digger game that grabbed up candy and gave that as a prize. We also got tickets, so he loved seeing those come out of the game. There was also a dump truck game which gave him great pleasure. I wanted to share a couple things Shane has done this week. As a Mom they are cute to me and probably not that exciting to any one else. But I'll share anyways. --At MOPS this week when I went to pick him up one of the ladies in the room told me this. She said that they opened one of the gates up and he kept going over and shutting it. Finally she told him it was okay to keep the gate open and that solved the problem. He left it alone after that. I told her that was very typical Shane. He must shut all things that are "suppose" to be shut. --At the Holiday party he had a thing of candy in his hands. A little boy walked by and he tried to give it to him. The little boy didn't notice. But it was super cute on Shane's part. Then later in the evening he had a cookie. A little girl walked by and Shane followed behind her trying to give her his cookie. Again she didn't see him doing it, but for some reason he really likes to share. --This week he decided that spitting on the window sill was a lot of fun. Finally I told him he needed to clean it up. We went and got a wash cloth from his "laundry center" in his kitchen and wiped it up. The next day he again was spitting on the window sill. I was doing something so I just let him do it. He was happy. I then watched him walk over and get a wash cloth from his kitchen, walk back to the window sill, wipe it up and then go back to his kitchen and put the wash cloth away. A quick learner and silly little guy he is! We don't normally have weeks like this. I try hard to limit the chaos and "overbooking", but for some reason this week just has way too much going on in it. This morning started out with me heading to the Doctors for a physical at 7:15am. It was planned this way so Kenny could stay home with Shane and not miss much work. BUT on Monday Kenny found out that he had a 8am meeting today. UGH! So I called up the best neighbor and friend in the world and thank goodness she was able to take Shane for the overlap between Kenny and I. She had him for about 30 minutes, but in that time I totally forgot that she had to take her son to the bus stop. Shane showed up to her house in PJ's. She thoughtfully bundled him up in a jacket and a hat, stuck him in a jogger with a blanket. He was happy as a clam when I showed up to get him. Oh...even better was that minutes before Kenny headed out the door to take him to Julie's, Shane fell and cut his lip really bad. Blood was every where. Great time to drop him off!! After gathering Shane up and getting him ready for the day we headed to MOPS. Where thank goodness he didn't cry for the first ever in the nursery!! That was super exciting to me. I hate dropping him off there and having him cry the whole time. It makes me sad and not enjoy what is suppose to be down time for me. We came home after that and got ready to go to work. Work went well, but before we left Kenny called and said he just found out he has a 5pm meeting this evening and won't be home until 7:30. Shane and I got home from work ate dinner and got him in bed. And it may just be one of those weeks, too. Oddly today, between Kenny, Shane and I we were involved in 4 different picture taking session. This morning started out with Shane getting his 18 month/Christmas pictures. Well.....I forgot his Christmas outfit. Yep...nice work Mom!! Kenny even took the morning off to help out with the whole production. We went ahead with the pictures any way. I learned a lesson in being flexible (as well as developing a plan to have Christmas pictures taken at a later date). Then we headed to see Santa. We waited in line there WAY too long. The whole time I was explaining to Shane that that was Santa and he was going to sit on his lap and get his picture taken. Guess the pep talk didn't help, because Shane didn't want to sit on Santa's lap and let everyone know that. When Kenny got to work he had his work holiday picture taken. Then this evening we had a photographer here from a local newspaper. In a random sort of way we ended up being interviewed for an article on how the economy was effecting our family. He was here taking pictures for that. We thought it would be a quick in and out, but he was here for an hour right before Shane's bed time, which is the witching hour for sure!! I think we are all pictured out for the day. And have a very full and busy week ahead of us still to come. Tuesday...here we come!! We are back from our Thanksgiving weekend in Sequim. We had yummy food, saw a movie (I saw 4 Christmas' with Becky and Kenny saw the new Bond movie with Kevin), watched football (I didn't do that part, you can guess who did though), ate more yummy food, read, relaxed, and visited friends. Shane eating his Thanksgiving dinner. His first ever actually. He LOVED the cranberries (Kenny's son for sure!). And by my surprise really liked the turkey, too. His first taste of pumpkin pie was a hit, too. He needed to get closer to the source here. Dad's lap was the place to be. We picked the doggies up early this afternoon. They are very happy to be home and out of the noisy kennel. We also got our Christmas tree and put up Christmas lights outside. A very productive day. Shane seems to have no interest in the Christmas tree. I was surprised by that, but I guess it's better then him trying to climb it. Which I thought was a huge possibility. I read The Shack by William P. Young this weekend. It was great read. Very thought provoking. It's a read at least twice kind of book in order to really grasp all the meaning in it. It made me think about making a list of books for Shane that I would love for him to read someday. So far the list has The Shack on it and Catcher in the Rye. I'm sure I have more to put on there, but that's it for now. Kenny took me to a bakery called Flying Apron in Fremont this morning that makes items that are vegan (no eggs or dairy is the part I was interested in), gluten free, and had some bread items that were yeast free, too. Sadly though the two breads that don't have the yeast in them they only make on Mondays. But I did get a bread mix, a muffin and a cinnamon roll. We then went and hung out at the farmers market. It was really cool, tons of neat things. Next we checked out PCC (a local natural food market). I could spend so much time and money there!! Finally we visited a t-shirt store Kenny had just saw on TV the other night called Destee Nation. They carry logo t-shirts from the Seattle area and a few from other places too. Another super cool place. I love hanging out over in the "big" city. The neighborhoods are so cute. And each little area has great little stores and events going on that are fun to check out. It's nice just to be a hop, skip and a jump away from all the city hustle and bustle, but not to have to live in it every day. Lake Washington Toddler Group -- AKA "preschool"
Kenny took the day off of work today, so that he could join Shane and I at preschool. Shane had a very mellow day at LWTG. His teeth seem to be bothering him again. He did enjoy showing Dad all the fun things he does at preschool, though. This weeks theme was Transportation. A huge hit with Shane! This was a new center this week. Sand with diggers!! Paint center...he loves to paint. New car station. Dad was making the cars do down the ramp. Sensory table with lentils. This is most fun when you dump the lentils on the floor. Playdough...which he LOVES to eat. Blue this week wasn't as good as the previous colors. Black seems to be his favorite to eat?!? Slide in the gross motor area. Climbing structure in the gross motor area. Water table. This is good to do after the playdough, so he can wash it down with a cup of "yummy" water. Sticker art. He is really into stickers right now. Circle time. He does great, staying usually the whole time. Bubbles. For sure the best, best part of the day.